This week we discuss about the much ignored muscles of the arm- The Triceps. The triceps are the muscles that run on the backside of upper arm from your shoulder to your elbow. They constitute two-thirds of your upper arm. Their primary function is to extend the elbow and facilitates the backward motion of the arm in the shoulder joint. The problem with the triceps is that as you get older your triceps will just keep getting softer and gooey. 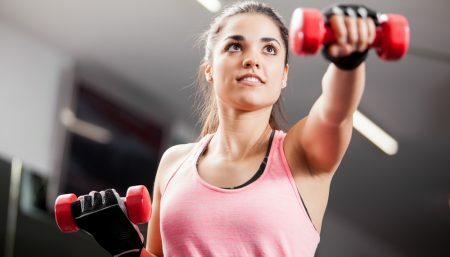 But don’t need to worry, because you can tighten and tone your arms by following a regular training routine. If you are too busy and can’t make it to a gym, you can always use your furniture as gym equipment. The triceps are a large muscle mass and needs to be trained more than the biceps, which are smaller. When you hear somebody comment on the size of someone’s arms, what they are really noticing is the development of that person’s triceps. The triceps are among the most visible parts of the body, whether flexing, exercising or just hanging out. Here’s a triad of exercises to help you carve those three stingy muscles. This exercise is for beginners who have completely no experience with strength training. Stand facing a wall/lie face down on the floor and do a press up against the wall/floor ensuring you get as full a range of movement possible at the elbow. Aim for three sets of 10 to 20 repetitions. After 2 to 3 weeks of these exercises, move onto more strenuous exercises. Stand with your shoulders low and relaxed, chest and rib cage lifted, and abdominals contracted. Raise your arms over your head and cross your wrists. Make two fists with your hands. Contract the muscles in your arms, shoulders and upper back and hold the contraction. Press your elbows down slowly to each side, squeezing your shoulder blades together, until your fists are level with your shoulders. Line up flat exercise bench wide enough apart so that when you lean on with the palms of your hands, the heels of your feet just fit on the edge of the bench without falling off. Curl your fingers around the edge of the bench, holding your hands outside of your hips. Slowly lower your body as far down as possible (until your upper arms are parallel to the floor) by bending your upper arms. Keep your forearms and elbows stationary throughout the exercise. Raise yourself to the starting position by pushing up with your triceps. Flex your triceps as you raise to the top. Try doing 20 repetitions of your own weight for 3 sets. If this is not difficult enough, you can always hook weights around yourwaist with a belt. Click here to view this exercise with detailed instructions and demonstration. Start with a light dumbbell in your right hand, with your palms facing in towards your body. Your right foot should be on the ground; your left knee and your left hand should rest on a bench for support. Position your upper arms so that from your shoulder to your elbow is parallel to the floor and stationary at all times. Your elbow should remain in close to your body. Your back should be straight and roughly parallel to the floor. Extend the dumbbell upwards until your arm is straight and fully extended and your triceps are contracted (flexed). Hold for a brief second flexing your triceps. Return the weight to the starting position in a slow, controlled manner. Repeat this motion for 10-12 repetitions on each arm. Do 3 sets on each side. Stand in front of the pulley machine in basic position with feet either parallel or with one foot forward. Your upper arms should rest at your sides, while your fore arms are bent at an angle of 45 (approx) with your hands holding the bent palms should be facing downwards. Straighten your arms in an even semicircular until almost fully extended. Slowly bring back the bar to the starting position with exactly the opposite movement. Try 12 reps over 3 sets. This exercise can be performed on either a flat or inclined bench. A number of handgrips can be used, however a close grip will work best to help develop your triceps. Hold a light barbell above your forehead, keeping a bend in your arms. In a smooth motion lift the weight above your head, until your arms are almost straight. Avoid arching your spine, keeping your feet on the bench will help prevent this, or alternatively, keep your feet firmly on the floor. Lower again, and repeat. Remember to avoid hitting your head. While sitting, grasp the band in front of the body with both hands about shoulder width apart. Bring one fist to the opposite shoulder to hold the band against the body. Holding the other forearm parallel to the floor, fully extend the arm and flex back to the shoulder in a nice controlled movement. If elbow, wrist or hand pain is aggravated, try different orientations of the palm (palm toward body, palm up, palm down) and different ranges of motion to find a pain-free combination. This is an excellent exercise to isolate the large triceps muscle at the back of the upper arm. Hold dumbbell with two hands, on both the bar and end of the weight. Make sure the weight is secure; (aim to use fixed weights). Whilst either sitting or standing, lift the weights from behind your head, arms bent, to a position where your arms are straight above your head. When moving the weight up or down, take care not to hit your head. Note: Make sure the weights are secure to avoid injury. Lying on your back, push a barbell up and down in a smooth movement. You can adjust the difficulty by increasing the weights and you can place more load on the tricep muscles by narrowing the grip. Gradually increase the weight and decrease the number of repetitions to 3 sets of 10 repetitions. It is useful to have a partner to assist in this exercises in case you get into trouble. An alternative without weights is the standard press up. Narrowing the hands will increase the load on the triceps. Lie face down on the floor and position your hands at 6 inches apart, 24 inches apart, or as wide as possible for the close, medium or wide variations, respectively. Your palms should be down, in contact with the floor. Your legs and body should be straight and your head should be in line with the spine. Press yourself upwards, fully extending your elbows and supporting the lower body on the toes. Alternately, this exercise can be performed with the knees bent – supporting the lower body on the knees. A wise way to work triceps into your workout regimen is to couple them with either chest or shoulder workouts. Remember, when using a barbell the total reps should be about 40. With dumbbells, the total number of reps will be about 60. For the most part you should do sets of 8-10. Also, for barbell work, use a straight bar not an EZ curl bar. Keep the rest periods short 15-60 seconds. The main goal of the tricep work is to build the area around the elbow. The long head is important for benching. When doing extensions, keep the barbell or dumbbells close to the head. Don’t turn it into a pullover.